Welcome to this latest edition of “from the C-Suite” by Jon Cobin, Gogo’s EVP and Chief Commercial Officer. There has been a good deal of chatter in the market about satellite ownership (as compared to leasing capacity) for supporting the inflight connectivity needs of commercial airlines. One might think this debate would come from the largest satellite operators in the world, but it isn’t. Instead it’s coming from Inmarsat and ViaSat, two small to mid-sized satellite operators who want the market to believe that “less is more” – that having a few available satellites is somehow better than having many. Commercial airlines aren’t in the business of buying satellite capacity. Commercial airlines are simply interested in providing a great Internet experience to passengers and leveraging highly reliable connectivity to improve their operations. It takes an end-to-end service provider to deliver on these promises and satellite capacity is only about one-third of the equation. With only about 100 aircraft served directly by Inmarsat and ViaSat combined (aircraft that leverage their satellite capacity are predominantly managed by other in-flight connectivity partners today), it’s perhaps no surprise that they do not recognize that the other two-thirds are critically important to airlines. These other elements include certification and installation of systems on aircraft, global logistics and maintenance, and the systems and software to present, manage and personalize passenger experiences on behalf of airlines. It’s important we acknowledge the role satellite capacity plays in delivering industry leading performance because our competitors from the satellite space have misquoted us as saying “satellites don’t matter; it’s all about the antenna.” What we have actually said is that antenna performance is very important and our 2Ku antenna is the best in the market. But we have also noted how critical satellites are to the end-to-end service. When it comes to satellite capacity, where we differ dramatically from ViaSat and Inmarsat is in our decision to lease capacity rather than own satellites. We are highly confident that our strategy presents a fundamentally better approach to providing the best service and the lowest risk for airlines. Here’s why. Today, the satellite industry is more dynamic than ever, with rapid changes in performance and cost structure. Capacity growth is exploding and unit prices are falling. The largest providers, including our partners – SES and Intelsat, deliver an open architecture with many satellites. Meanwhile, smaller players like ViaSat and Inmarsat are trying to sell a closed architecture consisting of just a few satellites. Why should this matter to airlines? It matters because leasing allows us to ride the innovation and cost/bit curve of a competitive market which results in better performance and economics. Being locked into a closed system means you are tied to point-in-time performance and economics, perhaps for many years. We also buy only what we need which allows us to maximize utilization. This further reduces our costs and therefore our pricing. With our leasing strategy, we can afford to dedicate 100 percent of the capacity we buy to aviation and don’t share it with other users. Whereas Viasat and Inmarsat need to oversubscribe their capacity by sharing it simultaneously between a number of users in homes, on ships and in aircraft. Dedicated capacity is critical for meeting aviation performance standards. What happens when capacity growth slows and supply becomes constrained? Interestingly, Inmarsat and ViaSat present differing opinions on this question. Inmarsat’s argument is that eventually satellite capacity growth will slow and capacity will become constrained in the market. They imply cost to purchase will rise (which it would) and that somehow satellite ownership is better than leasing. While it’s unclear whether slowing capacity growth over a prolonged period is a likely outcome for the satellite industry or not, the flaw in Inmarsat’s logic is that in a constrained market, access to more capacity across multiple, large suppliers would be more important than ever. If the satellite industry were to experience a disruption, it is hard to envision a benefit of locking in to one smaller provider with a closed system that is itself highly capacity constrained and where there are no options to improve capacity or economics. The ViaSat argument to aviation is that they have essentially “unlimited” capacity. They will explain that ViaSat-2 just launched with 2x more capacity than ViaSat-1 and that ViaSat-3 will launch sometime around 2020 or thereafter. What’s ignored in this argument is that ViaSat is already highly capacity constrained. ViaSat-1 is highly oversubscribed today while ViaSat-2 will rapidly fill up supporting their primary business – residential home broadband – which is struggling to compete with much stronger terrestrial providers. Tying one’s fortunes to ViaSat is a very risky bet. ViaSat is not positioned to reverse its challenges in the residential market. And, without a reversal, they will struggle to fund the satellites required to keep up with growing capacity needs, with customers stuck on a few, oversubscribed satellites. The key to reducing the risk and exposure to the ebb and flow of the satellite industry, regardless of any temporary over-supply or under-supply conditions, is access to a diverse, open ecosystem of many satellites across multiple scale providers, rather than reliance on a closed ecosystem of a few satellites from a single provider. When you have two or three satellites you must make a choice: Spread your capacity thinly across the globe or concentrate your capacity regionally. Let’s look at these two approaches. Inmarsat’s stated goal is to provide a consistent experience. This is one of their reasons for global coverage using a few satellites. The problem is that this strategy was developed in 2010 and is only now being implemented – seven years later. The result is broader coverage without enough capacity to serve aviation. How limited is Inmarsat’s self-described “thin” capacity? Consider this – our current ATG (air-to-ground) network in the US has 30x more capacity than Inmarsat over the same geography. (In fact, our ATG network had 3x the capacity way back in 2008 than Inmarsat’s network has today!) The only thing that will be consistent about Inmarsat’s experience is it will be slow and frustrating to passengers. Additionally, Inmarsat’s claim of “global coverage” is questionable as they have stated nearly 20% of the coverage area of each satellite will not be active. Add in more technical matters like how poorly the system performs in equatorial regions and how limited it’s coverage and performance are on polar routes and there is a good argument that not only does Inmarsat lack the capacity required for aviation, but also lacks the global coverage. With the launch of ViaSat-2, ViaSat will do two things: a) increase coverage over North America and the Atlantic Ocean and b) add 2x more capacity than what exists today. Said differently, they have added 7x the coverage while only adding 2x the capacity. When you do the math, it means ViaSat is only increasing the capacity over North America by about 30% (the planned ViaSat-3 satellites will represent an even smaller increase). And when you consider ViaSat’s 670,000 residential broadband subscribers are literally screaming for more capacity because their existing satellite is full, you can expect that 30% will be used up quickly. Today, aviation represents less than 5% of ViaSat’s revenue – how much of ViaSat’s shared capacity will be left for aircraft after the ground customers are served is unclear. The reality is, despite Viasat’s claims, we have significantly more capacity for aircraft than they do and a much better ability to add to it regularly and to put it where aircraft actually fly. This is true. However, best case it takes an average of 2-3 years to design, build, and launch an operational satellite. This doesn’t include the time needed to raise the capital as investment ranges from several hundred million dollars to nearly a billion. Therefore, when a satellite owner like ViaSat or Inmarsat says they can add capacity it means they may be able to add capacity in about three-plus years assuming they can raise the capital. As an airline, you are years away from relief if anything goes wrong. Today Gogo is leveraging 25+ satellites around the world from our partners – SES, Intelsat and others. Our partners are each adding three to four new satellites annually over the next five years. New capacity is continuously coming online and our open ecosystem approach means we have access to this capacity when we need it. 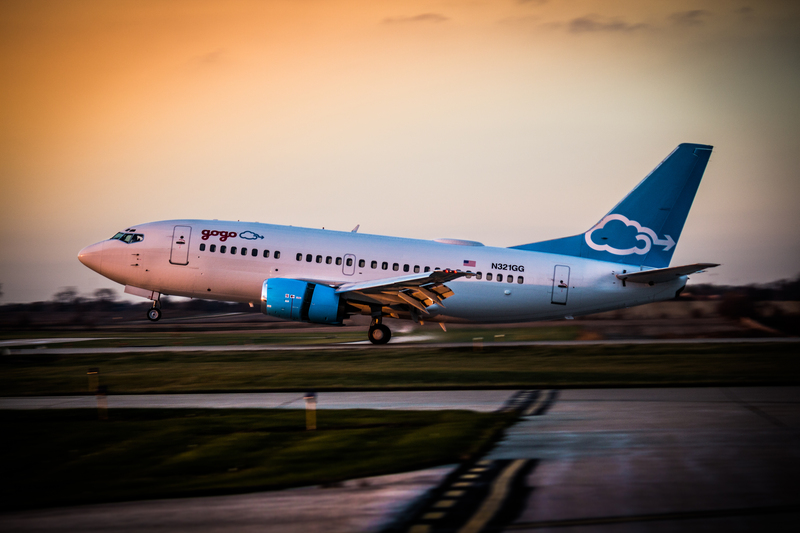 Currently, Gogo has access to 50 Gbps of global capacity that is dedicated to aviation –not shared with residential subscribers, maritime or anyone else. In 2018, this number grows to 100 Gbps dedicated to aviation. This is more than enough capacity to meet the growing needs of our current and expected future airline customers. However, if for some reason it’s not, we can easily get more, without building a satellite. Doesn’t a leasing strategy cost more because you don’t own the satellites? The cost structures (and business models) of our suppliers aren’t the same as Inmarsat’s or ViaSat’s. Inmarsat and ViaSat like to talk of margin stacking to imply that our costs must be higher. This would be truer if we bought from either of them, but we don’t. Our suppliers have a different business model. They launch satellites that are sized appropriately to improve utilization and are often designed for multiple markets that are served by separate and dedicated capacity. For example, a ~$200 million satellite with an Internet payload next to a (lucrative) broadcast payload will have a better cost structure than a $600 million satellite with only an Internet payload. Raw spectrum cost is only one determinant of bandwidth cost. ViaSat likes to oversimplify the math to argue they have a low cost per bit. Setting aside the fact that ViaSat uses overstated numbers to make this case, it also falls short because it ignores antenna performance and utilization, which combined are as important in determining cost per bandwidth delivered as raw spectrum cost. Simply put, we get more “miles per gallon” from the spectrum we lease than they do because of our antenna and because we buy the capacity we need – when and where we need it. This effectively offsets embedded satellite operator margins. We get to ride the performance and cost improvement curve regularly, they don’t. If you launch a state-of-the-art satellite in 2017, it is state-of-the-art in 2017. In 2019, it’s already been leapfrogged. We continually add state-of-the-art capacity and dollar cost average our cost structure down year over year. We don’t have to wait 3-5 years for a new satellite to get an improvement. And, again, focusing on purely the satellite cost ignores the other two-thirds of the business required to take care of airlines, aircraft and passengers. This cost structure is determined by aircraft served, not satellites owned. Doesn’t leasing result in a patchy network of different vendors and satellite technologies? No. Not if done correctly. We have decades of experience in mobility management and a wall full of patents. The core network technology know-how we apply is important whether the aircraft antenna is pointed up at a satellite or down to a ground-based site. We’ve seen others leveraging multiple satellites struggle and understand where this impression has come from, but we wouldn’t be delivering 98%+ system availability (industry-leading) if we weren’t able to manage hand-off’s between satellites the same way the mobile industry has for decades across cell sites. Our open ecosystem of satellite providers means we can access interoperable capacity and work with the satellite companies to ensure it meets the needs of aircraft. Last, because we’re not spending billions of dollars on satellites, we can afford to invest in innovative antenna, modem and network management technology to continually drive the best aero performance. How can we be so sure that leasing capacity is better than satellite ownership for aviation? Because we’ve been there. 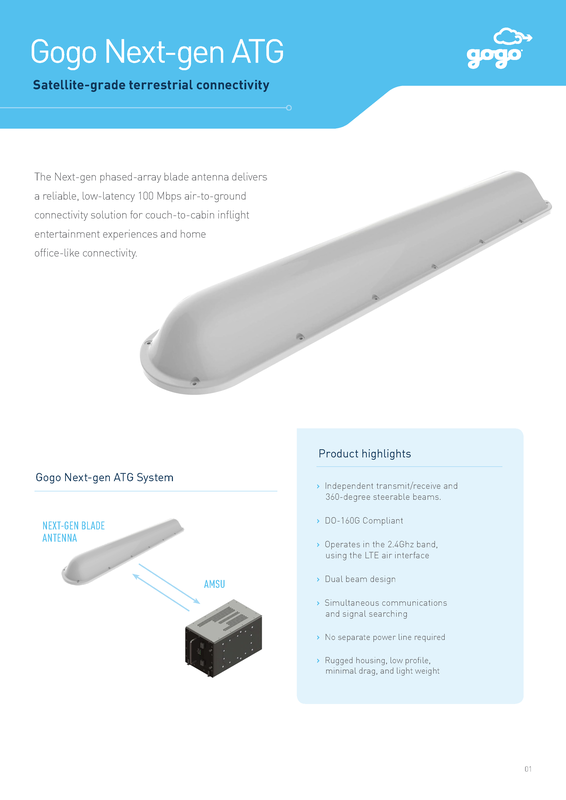 Our original air-to-ground (ATG) network is a closed system that is capacity constrained because we were limited to a narrow band of spectrum. Our entire strategy since has been focused on never being in this position again. The ability to leverage the most satellites around the world gives us the certainty of supply required to meet the demand of global aviation. 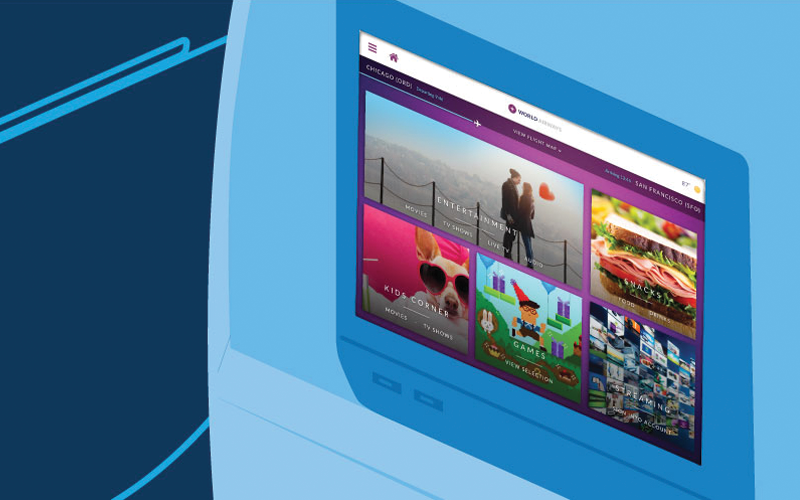 Internet connectivity on planes is entering a new era. One where the technology is able to ensure the passenger’s connectivity experience in the air is like their experience on the ground. This is increasing passenger expectations, particularly among younger travelers. The airline customers of tomorrow are already placing greater importance on quality Internet when choosing their preferred airline today. The decision an airline makes regarding their connectivity provider is an important one. We are confident that our leasing strategy is better for airlines because it reduces their risk and exposure to the ups and downs of the satellite industry, while ensuring the capacity and coverage needed to meet the growing demands of their connected passengers. And, ultimately, we believe airlines realize they face a key question – who is most invested in your success – a supplier who balances the needs of aviation with the needs of many other industries or a partner who is focused solely on providing the best connectivity experience to aviation? 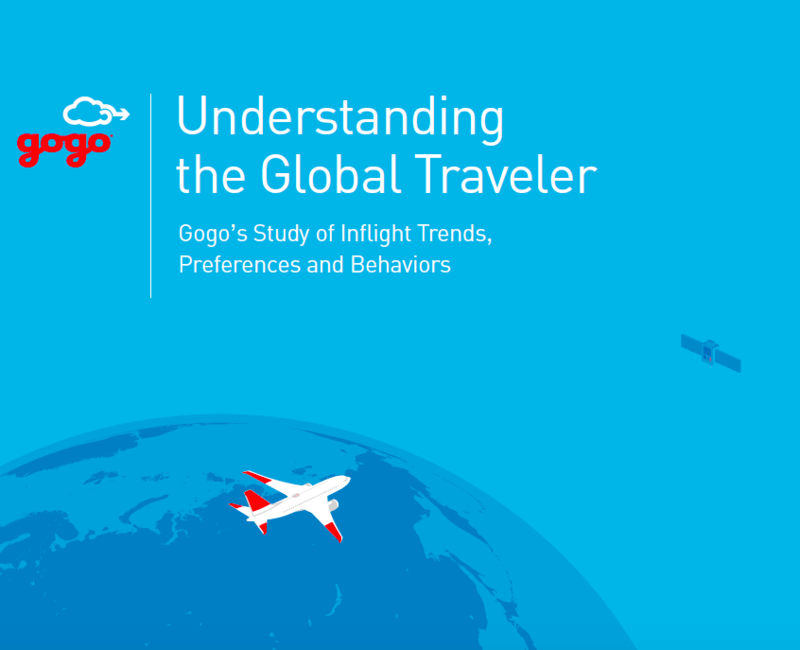 This is Gogo’s comprehensive study of the attitudes, habits and technology preferences of more than 4,500 airline passengers around the world. 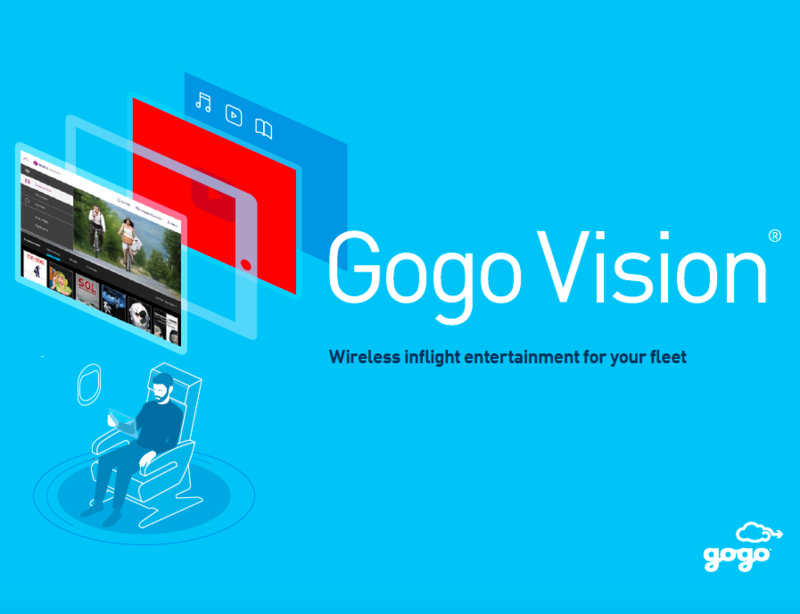 Leading airlines around the world rely on Gogo Vision to keep passengers connected and entertained throughout the flight. Learn more about this popular offering.